The Fury (1978), dir. Brian De Palma - The day this Twilight Time Blu-ray went on sale along with their other March release, John Carpenter's Christine, it sort of got lost in the shuffle. Because Twilight Time discs are limited to just 3000 copies, Christine was virtually sold out within hours, while The Fury still hangs on. But in my mind, De Palma's cheesy telekinetic espionage flick is the more influential and impactful film. Traces of its setup are evident in 1984's Firestarter, which switches out The Fury's character actor nemeses, John Cassavetes and Kirk Douglas for Martin Sheen and George C. Scott. Perhaps its tale of a covert agency developing the weapons capability of two psychics (based on a novel by John Farris) even inspired Stephen King to write the original novel Firestarter (1980) by way of De Palma, the first filmmaker to adapt King's work to the screen (Carrie). Idle speculation, but a few things are certain. Seeing a pretty, young Amy Irving shiver at the thought of touching her instructors at the Paragon Clinic—for fear of placing them in a coma—immediately calls Anna Paquin's Rogue (the X-Men trilogy) to mind. The brief displays of Irving's (and co-star Andrew Stevens') awesome psychokinetic powers won't adequately prepare you for what is a spectacularly grisly end to Cassavetes' morally bankrupt spymaster. And the Blu-ray includes an isolated track featuring John Williams' Herrmann-esque score, particularly effective in a classic, slow motion De Palma sequence depicting Irving's escape from the clinic and into Douglas's capable arms. Hemingway and Gellhorn (2012), dir. Philip Kaufman - After his execrable misfire, Twisted (2004), one of my very favorite directors, Philip Kaufman (The Right Stuff), was sent to "movie jail." So it's nice to see him return with a film that's more in his wheelhouse. Unfortunately, though HBO has obviously allowed Kaufman creative freedom, the limitations of a cable budget hurt this telemovie. Too frequently, shoddy digital effects work rotoscope leads Clive Owen and Nicole Kidman into archival footage in order to convey the two correspondents' globetrotting escapades throughout a number of far-flung wars. These montages completely take one out of the film. In contrast, Hemingway and Gellhorn soars during its intimate moments, situations that evoke some of Kaufman's most masterful historical romances, The Unbearable Lightness of Being, Henry and June, and Quills. Tight close-ups don't do much to hide the small, simple sets, but they do focus one's attention on the performances. Kidman is the strongest she's been in some time as smoky-voiced journalist Martha Gellhorn. Owen plays 'Papa' Hemingway a bit too soft and blustery. But they're both ably supported by a supporting cast that includes Joan Chen, Peter Coyote, Robert Duvall, Parker Posey, Tony Shalhoub, David Strathairn, and inexplicably, Lars Ulrich!? Worth a look. Panic in the Streets (1950), dir. Elia Kazan - As Kazan's filmography slowly makes its way to Blu-ray comes this grubby little noir, about a government doctor (Richard Widmark) trying to head off an outbreak of plague that started in New Orleans' underworld before it becomes a full-blown pandemic. 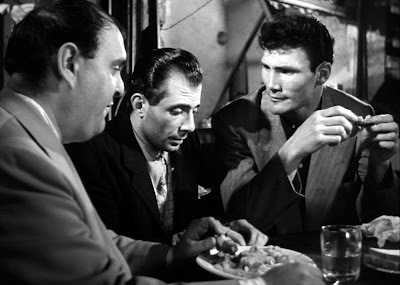 Giant, chisel-faced Jack Palance makes his debut here as a local gangster, standing out sharply against the film's population of small, caustic low-lifes (headed up by Zero Mostel). Not a one person in this film—including hero Widmark, his supportive wife (Barbara Bel Geddes) or even his young son—speak in any tone milder than acid-tinged sarcasm. Except for the soft-spoken, likable Palance... another reason why he seems to float above the Big Easy's detritus. Kazan's callous film may not immediately strike one as characteristic of his later, socially conscious work. But there is an undercurrent of this present in the way he demonstrates how easily New Orleans' individualistic citizens—from the least informed all of the way up to the they-should-know-better-and-do cops—distrust Widmark's doctor simply because of his public servant credentials. Kazan also illustrates Widmark's arrogance in believing that just because he works for the government he can avoid the typical niceties because "Goddammit, the government knows what it's doing." The digital transfer is superb, with legendary cinematographer Joe MacDonald's high-contrast imagery well served by the inkiest blacks and brightest whites I've seen up to this point on Blu-ray. Star Trek: Enterprise Season 1 (2001-2002) - Typically, in the weeks ahead of its release, my anticipation for any new Star Trek film (the upcoming Into Darkness) begins to crowd out other movies requiring perhaps more of my critical attention. And somehow CBS Home Entertainment knows this because they've begun to flood the market with Blu-ray releases of the numerous Trek incarnations. 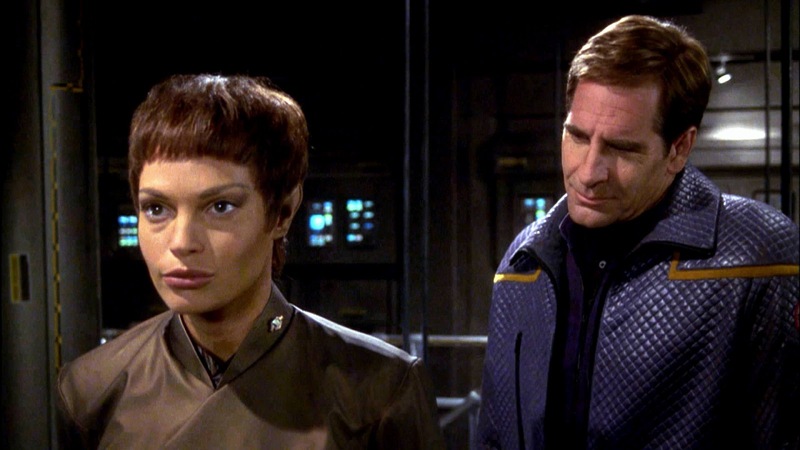 The original series and its sequel, The Next Generation, have both been re-jiggered to update their respective visual effects for high definition. (I'll be looking at TNG's Season 3 set in more detail in the coming weeks.) It being the most recent of the series, Enterprise (its full official name for the first two years of its run) needs no such upgrade and is already starting to roll out on Blu-ray before other series which preceded it. Watching the much maligned series over a decade later, I'm struck by how neatly continuity hounds could place the more contemporary Enterprise—a prequel to the retro original show featuring Kirk and Spock—between the altered timeline created by the Borg-influenced events in Star Trek: First Contact (1996) and the alternate timeline created by the events of J.J. Abrams' Star Trek (2009). In the latter, Simon Pegg's Scotty even makes a reference to series' lead Captain Archer (Scott Bakula) and his pet beagle. 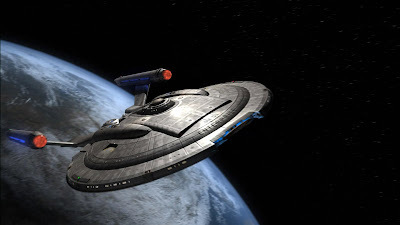 For Trek novices, though, Enterprise represents an accessible way to feed any cravings sparked by Abrams' film, presenting stories explaining just how Starfleet began its intrepid journey into space, what spurred the creation of the later-to-be venerated Prime Directive, and how humans learned to become comfortable with alien peers like the dispassionate Vulcans. What really makes these discs essential are the voluminous new extras featuring interviews and commentaries with cast and crew. 10 years later, they are more candid than ever about the shortcomings that led to the show's cancellation and the dismissal of Rick Berman, Brannon Braga (and the team they had in place through 18 continuous years of Star Trek series) in favor of Abrams' fresh-blooded team.